Finally the tutorial is ready! I thought that I would finish it in two days but I was wrong. The tutorial was more complicated than I expected. It took me three days to finish the English and Portuguese version. I designed this set to participate of a contest hosted by Bello Modo. 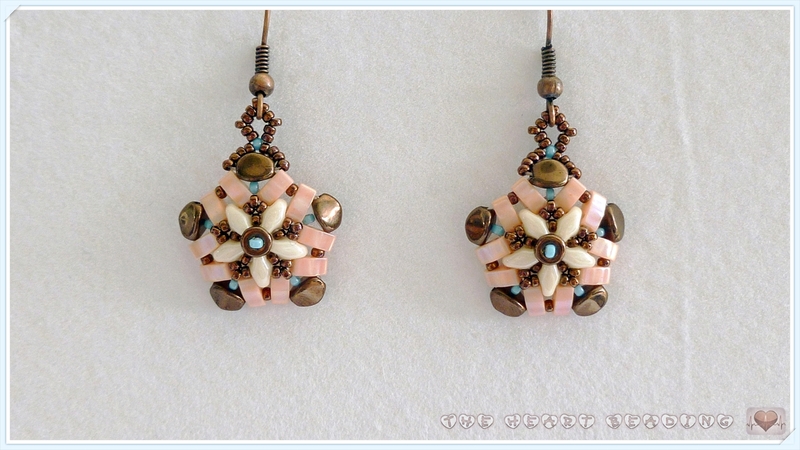 To participate of the contest you should create an original design with the new Half Tilas beads. In the Miyuki's website there's a lot of beautiful designs using the half tilas which I used as inspiration. To see them click HERE. Unfortunately this tutorial is not suitable for beginners. It's necessary that you have some experience with beadwork to understand all the steps to create the components and specially to understand how to assemble the bracelet. As you can see in the picture below, the components have five sides. So to create the bracelet you must connect them in a zigzag way, to keep the bracelet straight. I recommend you place the components on a table and arrange them in the correct position before you start to assemble the bracelet. The bracelet I made measures 6.7" or 17 cm with the magnetic clasp. My wrist also measures 17 cm and the bracelet fits a little bit tight. So if you want it more loose on your wrist, you can use a bigger clasp or you can make one more component. Each component measures 0.8" or 2 cm approximately. And the join between the components measures 0.15" or 0.4 cm approximately. To finish this post I would like to know what you think about the light in this video. This time I decided to shoot the tutorial outdoors, using daylight. The only problem about it is that sometimes the sky becomes cloudy and consequently, the light in the video becomes dimmer. So tell me if you like more this video with natural light or the previous videos with artificial light. That's it! I hope you enjoy the tutorial. If you have any questions about it, please leave a comment or send me and email. I'll answer as soon as possible. To start our new topic - products review - I'll show you the purchase I made last month at Bello Modo. This is one of my favorite online stores. Their prices are reasonable (similar to the other online stores where I usually buy) and they are often offering deals. This time, for example, I bought everything with a discount of 20%. Their customer service is also good - they answer my emails pretty fast. And they ship to any country. The envelope is internally coated with a bubble plastic layer to add an extra protection. 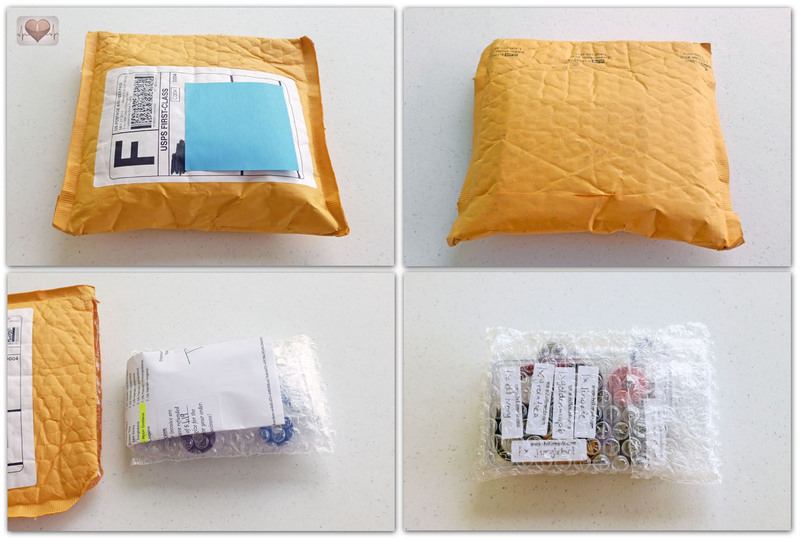 The products come in a plastic bubble bag. Along with them comes an invoice stating all materials you bought and the materials that are missing (in case of some product be out of stock). 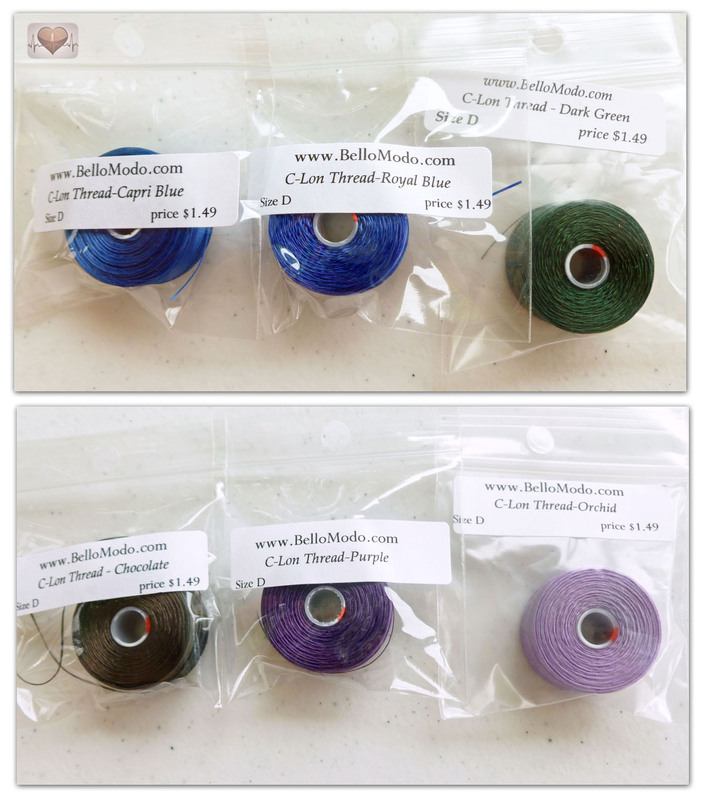 That's my purchase: beading threads and silk ribbons. 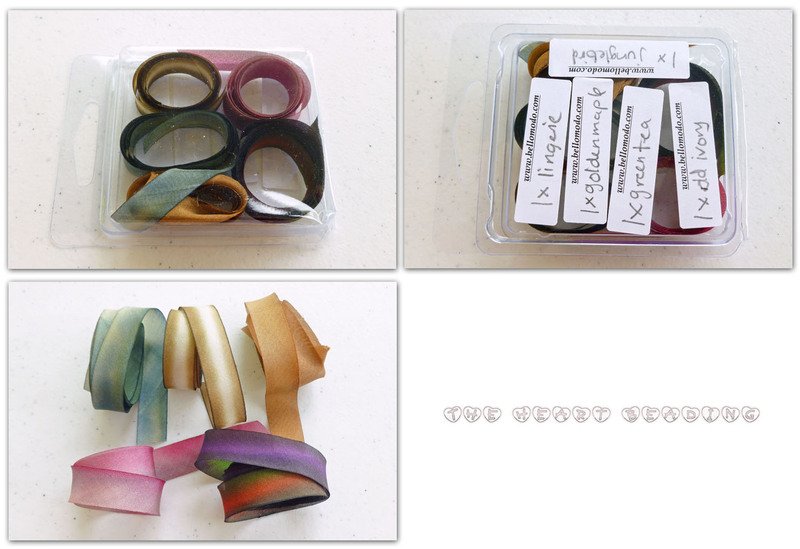 The silk ribbons are hand-dyed and they are made in USA. They're available in different sizes. I chose the thinner one - 7/16" width - because I'm planning use them in some netting bracelets. They are sold by the yard (0.91m approx). What I most like of these ribbons (besides the great collors) is the fact they don't fray so easily. If you want to see all the colors available, click HERE. Now, the threads. This time I bought only C-lon, size D. I like very much of this thread because, despite it can get tangled more easily, it's resistant and it has a low price. To prevent it to fray and to get tangles easily, I always condition the thread with beeswax or thread heaven. C-lon size D is thicker than Nymo size B, KO and Toho One G. So it's not suitable for all kind of projects. 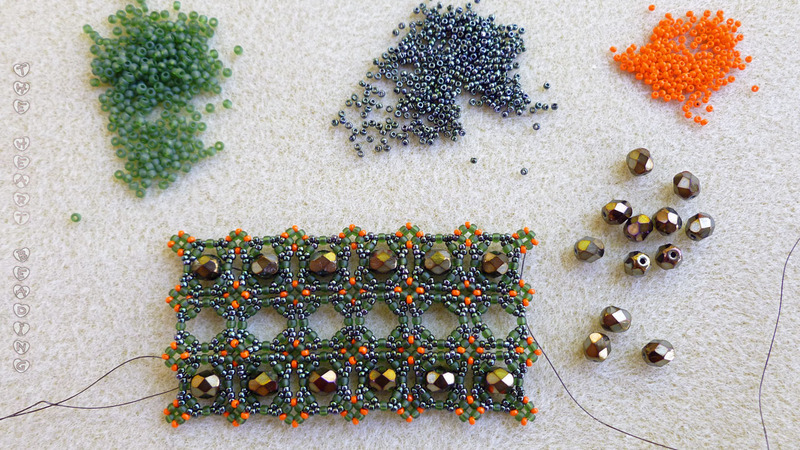 If you are using seed beads 15/0 in your project, or if the design asks to pass through the same bead many times, I don't recommend you to use this thread. The C-lon is also available in a thinner size - AA, but I never tried it because I'm afraid that it may be as weak as Nymo size B. In the last picture you can see the gift I received - a small sample of firepolished beads. 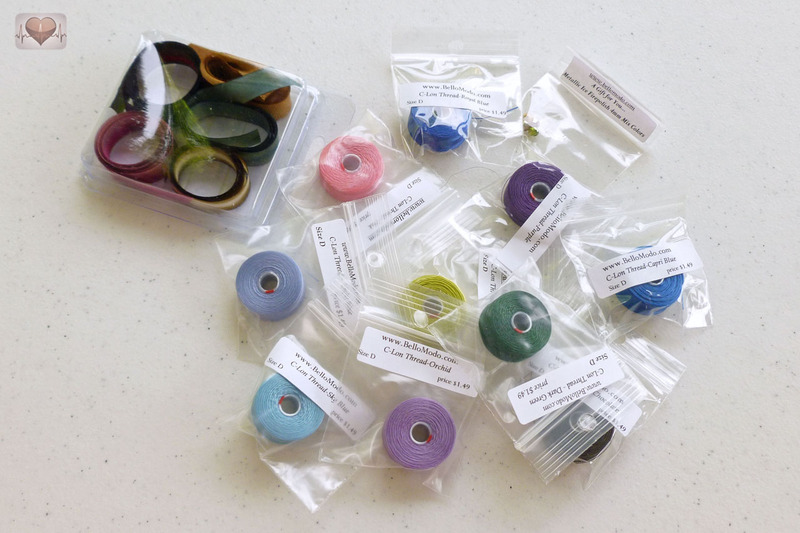 They always include a small sample of random beads as a gift in each purchase. Hi everyone! First of all I want to apologize for not posting anything new for almost one month. The reason is: I was making some improvements in the blog to make it more friendly for you. As you may have noticed I changed the logo and the blog's design. I also separated the English and Portuguese content. Now this blog will be in English only. 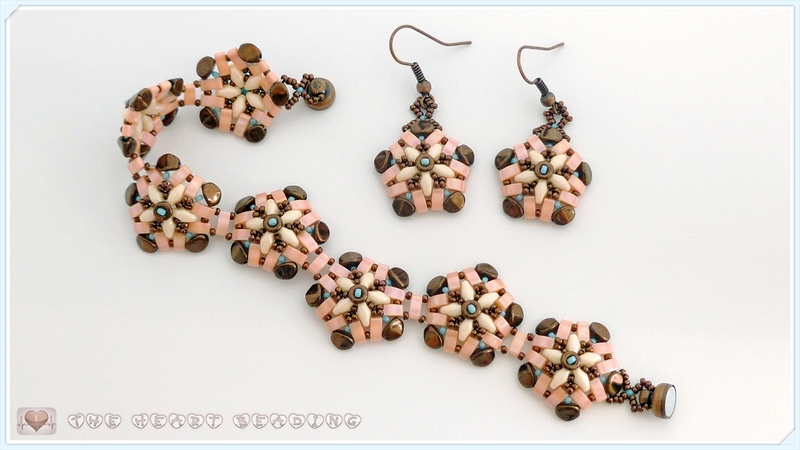 All the Portuguese content was moved to a new blog: The Heart Beading Brasil. But don't worry, the two blogs are similar and both will always have the same content. And thinking about the people who don't speak English or Portuguese, I added a translation tool. The funny thing about it is that some friends, after they saw the changes, asked me why I'll keep two blogs if now there's the translation tool. The answer is: unfortunately, the automatic translation is far from perfect. It cannot replace the custom translation yet. I also categorized all posts by topic to make it easier when you're looking for a specific content. As you can see in the menu at the top of the blog, I listed all existing categories. Now it's easy to find, for example, bracelet tutorials, articles for beginners, or organization ideas for your craft space. Another improvement is the new topic that I created: the product reviews. I receive many emails from people asking me about the materials I use in my projects. So I thought it could be a good idea take photos of the materials I bought and make a review of them and of the stores where I bought them. In this way everyone (especially the beginners) will eventually become familiar with the materials. Well, that's it! All those improvements are a gift for all of you, to celebrate the blog's first year. I hope with all my heart that you enjoy! And if you have any suggestion or question, please send me an email or leave a comment. Your opinions, questions and ideas are always welcome! And to inspire you, I'll let a photo of my work in progress. This bracelet was designed by Sabine Lippert. This is a really lovely pattern. When I finish it, I'll post a detailed review. Happy beading!! !